Dance practitioners and researchers from Middlesex University return to the Beijing Dance Academy in October 2014 for a series of performances celebrating the renowned Chinese institution's 60th anniversary. Five years ago, artists and academics from the UK, China and Taiwan arrived at Beijing Dance Academy (BDA) to begin a pioneering, intercultural exchange called ArtsCross. Designed to improve dialogue between East and West at a critical moment in time, ArtsCross sought to harness the transformative power of the arts while developing intercultural relations through professional, personal and institutional exchange. Conceived by Middlesex University's Professor Chris Bannerman and Associate professor Xu Rui of the BDA, the first ArtsCross in 2009 took three years to plan and brought together around 60 dancers, choreographers and academics from very different cultural backgrounds. Over a period of weeks, artists from the UK, China and Taiwan worked together to develop performance works around the theme 'dancing in a shaking world', while academic researchers from the three countries observed and wrote about the processes they were witnessing. "It's about using arts as an intercultural communication channel," says Professor Bannerman, who is Head of ResCen, the Centre for Research into Creation in the Performing Arts. "ArtsCross was based upon some of the ResCen notions of watching artists at work, but it was also intercultural in the sense that there were artists from the UK, China and Taiwan." The culmination of the 2009 project was a hugely successful performance which attracted a lot of attention, in part because it was almost certainly the first time that artists from China, Taiwan and the UK had worked together in Beijing. Bids for more funding were successful, and in 2011 a three-year collaboration between Middlesex University, Queen Mary University London, BDA and Taipei National University of the Arts (TNUA) began. 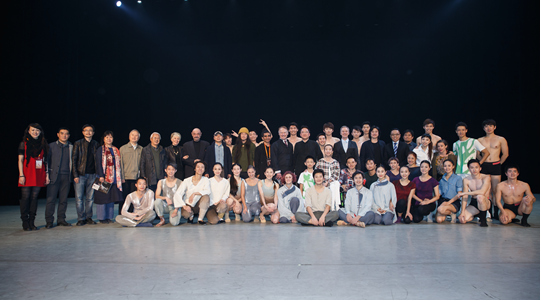 This included a return to Beijing, as well as visits to Taipei and London – where works were performed at The Place, the UK's premiere centre for contemporary dance. "The principal of the project is that creative artists from Taiwan, China and the UK come together to make practical work with performers from those countries too, working together in mixed environments to create new dance works," Prof Bannerman explains. On each occasion, the choreographers work to a different theme, creating pieces lasting up to 10 minutes with as many as six dancers. While the artists work together, academics observe their processes and hold seminars to discuss a range of topics, including the working practices of the artists. "Part of the point in that is that we get to know each other by working together. You can have a meeting or read a book, but nothing is quite like working with people," Prof Bannerman adds. "Another key other point is that academics gain new insights into performance through working in, and seeing performance in different contexts." Following the overwhelming success of the ArtsCross project, Professor Bannerman is hopeful that the initiative will continue and expects a book about the project to be written in due course. In October 2014 many of those involved will accompany Professor Bannerman and Professor Carole-Anne Upton, Dean of Media and Performing Arts, in a visit to Beijing to take part in an ArtsCross 'greatest hits' performance as part of the BDA's 60th anniversary celebrations. This includes artists Jonathan Lunn, Rachel Lopez de la Nieta, Katie Cambridge and Azzura Ardovini; as well as BA Dance Performance graduates Harshil Chauhan and Narjal Guzikova, who will be performing Robert Cohan's celebrated piece Forest. Photo: ArtsCross/Danscross 5th Anniversary Performance, by Liu Haidong.